Pictured back row from left are prizewinners Ryan Tulloch, Ivan Leslie, Gary Wilson, Jamie Drever, Alan Gray with KDDL treasurer David Henderson. Missing from picture is furthest lady winner Jenni Tully. Front row from left, KDDL president Craig Taylor, winner Kevin Gray, runner-up Keith Hood, and KDDL secretary Brian Moar. 85 keen participants turned up to the Masonic on Saturday for the 2019 Tennents Kirkwall Open, including 17 Ladies, and players from as far flung places as Shetland and the Borders, showing the appeal this competition has now. Included in this number were several members of the Tully family, who were on their annual pilgrimage to visit the grave of their father Pat (former Orkney County football manager), including ex-Scotland Women's International Jenni Tully. Although a lower turnout compared to previous years, there was a terrific atmosphere in the venue all day, and the crowd were treated to some tremendous entertainment. Early in the competition young Nicol Gray set the tone for the day, checking out a maximum 170 finish in his 3-2 defeat to Frank Tully. Kevin Gray and Derek Firth met once again in singles competition and once more served up a cracking game for those watching. Jamie Drever has had a great season, and continued his recent form by beating legendary Shetland player Roger Irvine in the last 16, securing in the process his prize of £100 for the furthest KDDL 'B' player. 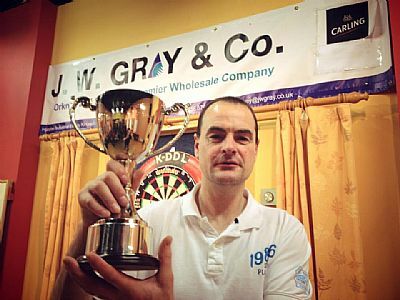 He would meet Kevin Gray, who followed up his win over Derek with an equally close win over Shetlander Gareth MacRitchie. Unfortunately for Jamie, Kevin was on top form, pulling out three 17 dart legs to win 3-0. Elsewhere, Alan Gray summoned all the experience of his 61 (and three quarters!) years to narrowly pip four times Open winner Stevie Linklater. Ivan Leslie produced a steady display of scoring in his 3-0 quarter win over Gary Wilson and Borders County player Keith Hood was quietly going about his progress with a 3-1 win over Ryan Tulloch, who had previously defeated furthest lady winner Jenni Tully in the last 16. By semi-final time, in the battle of the Gray's, Alan appeared to have just run out of steam after a brilliant day of darts, although he did secure a leg against Kevin to what must have been one of the loudest cheers of the day. Kevin ran out 4-1 winner. The other semi-final saw Ivan struggle to keep up with Keith, going 3-1 behind, but with the local crowd cheering him on he clawed it back to 3-3, before eventually missing a chance to win, and the Borders man was clinical on his finish. With the lower entry coupled with a pretty smooth running day, the final took place early by Kirkwall Open standards and was all the better because of it. A sizeable crowd had remained to watch, with many locals intrigued to find out if the trophy would be leaving Orkney for the first time in its 11 year history. Keith Hood was not only up against Kevin Gray, but also a friendly yet fiercely partisan and vocal home crowd. Keith had his followers though, as he was cheered on by his Borders colleagues and a few other non-Orcadians joined in to try and equalise the cheers, all adding to the atmosphere. All that was required now was a nail biting finale to the competition, and boy did they provide it! Kevin won the bull-up, which is usually a huge advantage in these competitions, but unusually all of the first 8 legs went against the throw, with Keith continually pinching Kevin's throw, only for the Shapinsay man to dig deep and hit back, and so the match ebbed and flowed until Kevin eventually hauled himself level at 4 legs apiece. By this stage everyone in the hall was literally on the edge of their seat. The deciding leg started with Kevin racing ahead, but Keith was never too far behind. As Kevin missed tops on a potential 105 finish, Keith popped in a 125 score to leave himself also sitting on tops and, with how clinical he had been on doubles all day, it was looking unlikely he'd miss if given the opportunity. 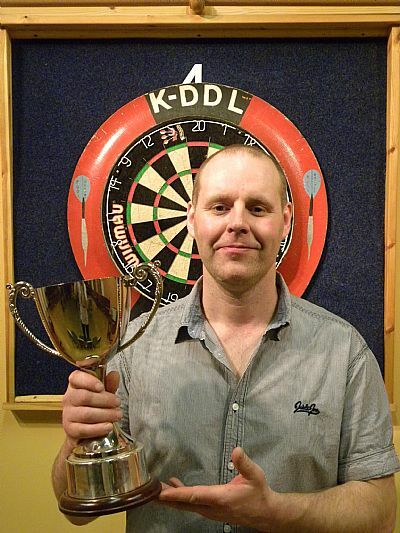 Kevin's first dart was close but just too high, his second dart hit his flight and deflected upwards away from the double, but his third dart was true and landed him his third Kirkwall Open title and a very handy £500 first prize. The Kirkwall and District Darts league would like to very much thank Tennent's and J.W. Gray & Co for the continued valued support, and all those who donated to the bottle stall and raffle. 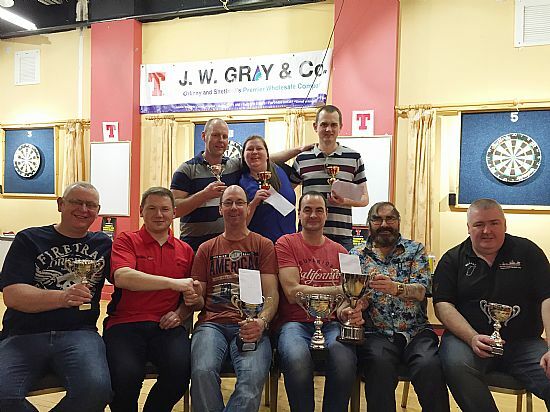 Prizewinners on the day: Highest checkout – Nicol Gray 170 - vodka; Furthest 'B' player -Jamie Drever - £100; Furthest lady – Jenni Tully - £100; Quarter finalists – Jamie Drever, Stevie Linklater, Gary Wilson and Ryan Tulloch - £20 each; Semi-finalists – Alan Gray, Ivan Leslie - £50 each; Runner-up – Keith Hood - £200; Winner – Kevin Gray - £500. 180s: Stuart Thomson, Ben Johnston, Alan Findlay, Doug Simpson, Gary Wilson, Derek Firth, Jamie Drever, Alan Gray, Keith Hood, Gareth MacRitchie (two), Stevie Linklater (two) and Kevin Gray (two). High checkouts: Erlend Lennie 104, John Tully 110, Stevie Linklater 110, Ivan Leslie 111, Craig Taylor 112, Ian Linklater 114, Derek Firth 156 and Nicol Gray 170. 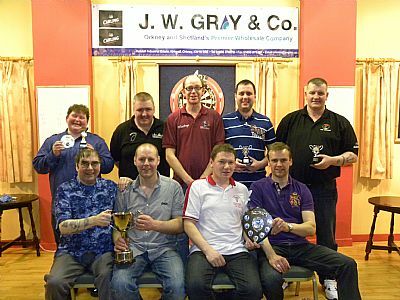 96 players contested the JW Gray & Co Tennent's Kirkwall Open Darts Singles on Saturday, March 10, 2018. 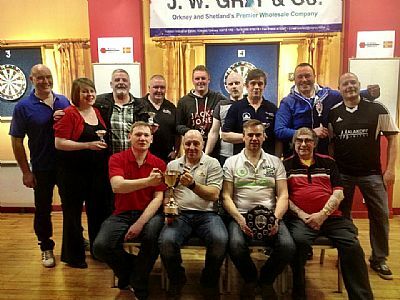 Organised by Kirkwall and District Darts League, the biggest cash prizes in Orkney Darts were up for grabs thanks to the sponsors. Joining local players in the packed Masonic Club in Kirkwall were a strong contingent from Shetland, joining 12 players who made the long journey up from the Scottish Borders, as well as players from other areas, including Aberdeenshire. Kay Peace made it to the last 16 of the competition, before being put out by Stevie Linklater, winning her the top lady prize of £100. Robbie Norquoy won the furthest progressing B player £100 prize. He too was halted by Stevie, in the quarter-final stage. In the other quarter finals Shetland's Gareth MacRitchie took out former winner Kevin Gray 3-2, while Brett Dickinson beat Jamie Aitchison from the Borders, by the same score. Defending Champion Ivan Leslie took out Borders visitor Peter Craig 3-1, with a 180 and a 111 finish giving Ivan a 12 dart leg. In a great atmosphere a strong crowd watched the action as to who would be crowned champion. The semi finals saw Gareth beat Brett 4-3 in a very tight game, while Stevie overcame Ivan 4-1, with both players hitting 180's. So it was an Orkney v Shetland final. Would the trophy go out of Orkney for the first time it the 10 year history of the competition? This answer was no, as Stevie powered to a 5-0 victory in a one sided final, with Stevie's heavy scoring proving too much for Gareth. Stevie won the title for the fourth time, picking up the cup and £500 cash. Gareth won £200. Each semi-finalist won £50, and the quarter-finalists £20 each. In total £1080 prize money was given out on the day. Thanks to everyone who took part and for all the generous donations to the bottle stall and raffles. The committee of the KDDL would like to thank JW Gray & Co and Tennent's for their valued and continued support of the event. 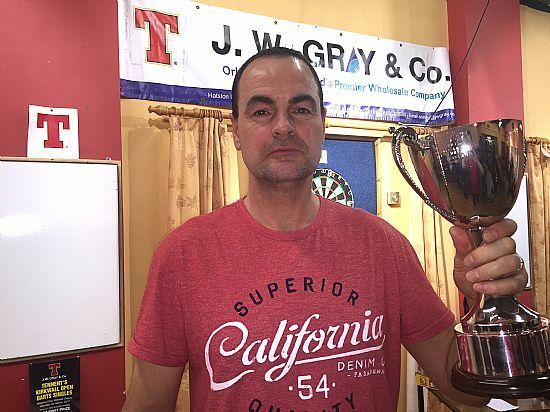 Silverware and £500 for Ivan Leslie as he wins, for the second time, the JW Gray & Co Tennent's Kirkwall Open Darts Singles, organised by the KDDL. Kirkwall Open prizewinners. Pictured back row from left are Kevin Gray, quarter finalist, Kelly Harcus, furthest progressing lady, and Jamie Marwick, furthest progressing KDDL B-player. Missing from back row are quarter finalists Ryan Tulloch, Stevie Linklater and Paul Foubister and highest lady finish winner Noreen Bain (108). 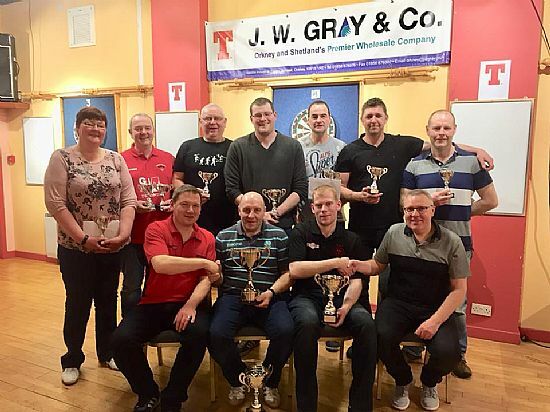 Pictured in the front row from left, are Peter Craig, semi- finalist & highest checkout winner with 161, Craig Taylor KDDL president, Ian Linklater, runner-up, Ivan Leslie, winner of the JW Gray Tennant's Kirkwall Open, Jim Scollie, KDDL secretary, and Roger Irvine semi-finalist. 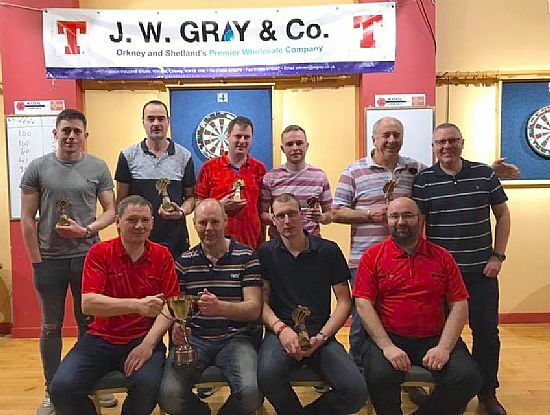 The Tennent's JW Gray Kirkwall Open just gets better and better as 107 people put their names down for the ninth open tournament. Twenty-one ladies entered, with Shona Gray and Nicky Laird making the last 32, but the star lady was Kelly Harcus, who beat two male players to make the last 16 and scoop the top lady prize of £100. Kelly’s run was ended by the star player from the Borders, Peter Craig, one of five players who travelled for the tournament. There were also players from Western Isles and Shetland. Defending champion Kevin Gray lost out in the quarter finals to Ivan Leslie, who was joined in the last four by Peter Craig, Roger Irvine from Shetland, and Orkney’s Ian Linklater. Ivan’s 4-0 victory over Roger and Ian’s 4-1 win against Peter ensured that it would be two KDDL players who would compete in the showpiece, with the cup guaranteed to remain in Kirkwall, as it has done for the eight years previous. The final itself, wouldn’t have looked out of place on television. The score of 5-2 to Ivan looks one-sided, but it was far from it — Ivan just seemed to have the first dart at a double and he wasn’t missing anything. Ivan picked up the £500 first prize courtesy of the sponsors, with Ian winning £200 as runner up. Peter Craig from the Borders took the top checkout prize with a 161. The top ‘B’ player and £100 winner was Jamie Marwick, who beat Derek Ward jnr in a play-off. In total well over £1000 was won on the day by players reaching various stages of the competition. 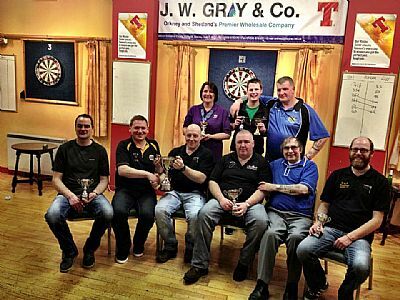 The biggest prize money in Orkney darts was on offer at the weekend when the JW Gray & Co Tennent's 2016 Kirkwall Open took place in the Masonic Club in Kirkwall. Organised and run by the KDDL the event has over £1000 in cash prizes awaiting the winners, plus numerous other prizes on offer throughout the day. The 2016 Open attracted 108 entries, from Orkney, Shetland and the Scottish mainland and included 21 lady players. Stevie Linklater had won the trophy two years in a row, and was aiming for the hat-tick, however his run in the competition was halted by team-mate Bruce Moar who knocked him out the round before the quarter-finals. By semi-final time KDDL's Kevin Gray and Ivan Leslie met, with Kevin winning 4-2 to book his place in the final. 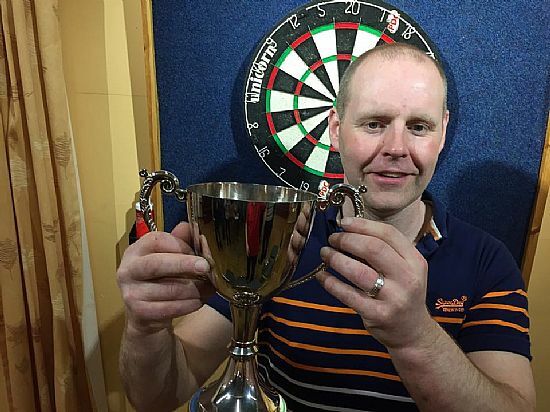 The other semi saw Shetland's Roger Irvine from Whalsay facing Jamie Marwick, from Rousay, who lives and plays his league darts in Aberdeenshire. It was Jamie who made his way into his first ever Kirkwall Open final, beating Roger 4-1. The final was an absolute classic and saw a tremendous standard of darts, with four 180's and a 120 check-out from Jamie, with two 180's from Kevin. Despite the 180's advantage, it was Kevin who triumphed, beating Jamie 5-3 in the best of nine final. Kevin won the title and £500, with Jamie winning the runner-up prize of £200. 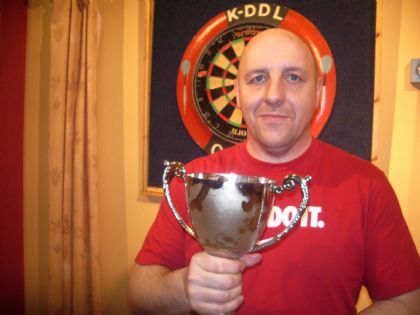 This is the second time that on-form Kevin has won the competition, also claiming the title back in 2012. Other prizewinners on the day were semi-finalists Ivan Leslie and Roger Irvine who won £50 each. Quarter finalists were Paul Foubister, Bruce Moar, Frank Watt and Derek Firth who won £20 each. Furthest B Player Davie Henderson won £100 as did furthest lady player Nicky Laird. KDDL president Craig Taylor said that on behalf of himself and the league committee he wished to thank everyone who made the day such a success, especially the ladies who sold raffle tickets throughout the day, Charlie and the staff of the Masonic Club, John Craigie for his continued support, Mitzi for the meals, and to anyone who helped out in any way, including the volunteer markers and people who donated prizes. The committee are extremely grateful to sponsors Tennent's and JW Gray & Co for their continued financial support which is greatly appreciated. Thanks also go to Malcolm Coghill for donating the dartboard and shirt signed by the professionals who visited Orkney last year. They were auctioned and won by Kay Peace and Karen and Bob Budge raising £220. The money will be donated from the KDDL to the British Heart Foundation and Fishermen's Mission. Finally, thanks also go to league secretary Jim Scollie who generously donated is usual huge number of 'Tattie Bogle' special prizes, but could not be there on the day due to being unwell. We wish him a speedy recovery. Craig also said that would also like to thank KDDL committee members, Robbie Stanger, Richard Polson, Stevie Linklater and Davie Henderson for all their work in making the day such a success and running smoothly. Saturday March 7 saw 102 players -including 19 ladies - from across Orkney and many of our friends from overseas enter the 7th annual Kirkwall open kindly sponsored by Tennent’s and J.W. Gray & co. There were some mouth watering ties early on and some very close games as the draw threw up a few tasty encounters. Early on in the day, Ben Hogan won his first game with two ton-plus checkouts, including the excellent 152 finish that netted him the trophy for the highest checkout. 6 ladies received byes into the last 64 but that was as far as any of them were to progress. Those ladies then went into a round robin of their own (kindly run by the women themselves) and eventually Katie Croy defeated Jacqui Stevenson 2-0 to claim the top lady trophy and the £100 prize. Elsewhere in the draw, B league players Scott Wilson and Keith Bain both progressed to the last 16 with Scott notably taking the scalp of regular intercounty player Iain Wilkie along the way. They then had a playoff to determine the furthest B player and Keith finally came out on top, claiming the £100 prize. By quarter-final time there was a real mix of players left in the draw. 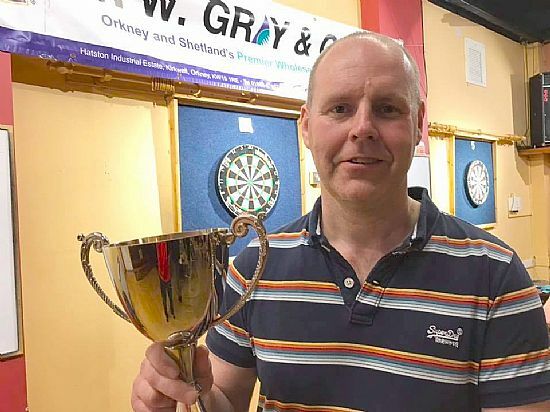 Kevin McGregor from John O’Groats crashed out to Westray’s Jim Brown before Stevie Linklater defeated Shetland’s Roger Irvine in what was a repeat of last years final. Frank Watt from Shetland was just too much for the Pomona’s Graham Flett to handle while John Munson from the Merkister couldn’t find enough to topple 2011 champion Robbie Stanger. The first semi-final saw a clash of team mates from the Orkney Golf Club and Stevie Linklater just had the better of Jim Brown in a very close game, eventually winning 4-2. Robbie Stanger had a somewhat easier time of it in his semi final, comfortably cruising to a 4-0 win over Frank Watt, who we will see back in Orkney later in April as part of the Shetland intercounty team. Into the final and it was a clash between previous champion Robbie Stanger and current holder and two-times winner Stevie Linklater. Despite the obvious nerves both players played well with Robbie finishing with a 75.56 average and Stevie with 79.48. Stevie began by breaking Robbie’s throw, going 2 nil up before Robbie hit back with the third leg. A few missed darts at double by Robbie in the 4th might have altered the game but Stevie took it and then streaked away to record a 5-1 victory to take the title and £500 first prize. 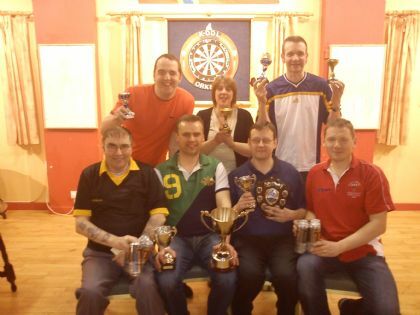 The KDDL committee would like to thank everyone who took part for producing such a fun atmosphere along with some cracking darts, it really is what the Kirkwall Open is all about and we hope its just as enjoyable in 2016. Thanks also to all who helped out on the day with the bottle stall, selling raffle tickets, organising games and running the womens playoffs, it was very much appreciated. Special thanks must also go to Charlie and the Masonic bar staff, and in particular John Craigie who always goes above and beyond to help us out. We couldn’t run such an event without the work they do behind the scenes in preparation for it, much of which goes unseen by the players taking part. And finally a huge thank you to Tattie Bogle who was unfortunately injured this year and unable to run the competition as he normally does. His overseeing eye and input into proceedings was very much appreciated. Hopefully he’ll be back in his usual role before too long. 180’s on the day: Stevie Linklater, Erlend Lennie, Paul Firth, James Flett, Erlend Ritch, Erlend Pirie, Derek Firth, Liam Drever, Kevin Gray (2) and Robbie Stanger (3). Checkouts on the day: Paul Firth 101, Liam Drever 102, Martin Shearer 104, Robbie Stanger 107, Davy Henderson 116, Nigel Williamson 135, Iain Wilkie 148, Stevie Linklater 102 & 116, Roger Irvine 111 & 113, Ben Hogan 113 & 152 and Kevin McGregor 105, 113 & 116. 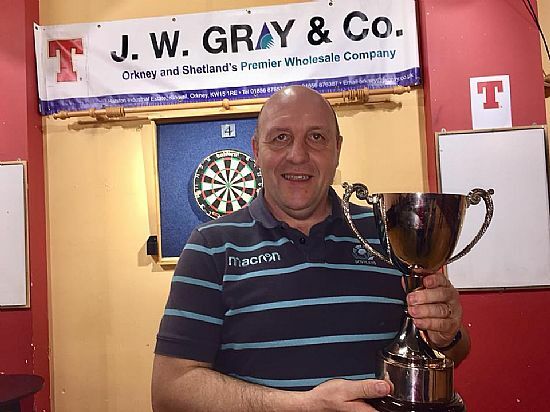 Stevie Linklater won the £500 first prize in the 2014 JW Gray Tennent’s Kirkwall Open beating Shetland's Roger Irvine 5-4 in the final. Losing semi-finalists were Iain Wilkie and Ivan Leslie. Furthest B player was Gary Wilson and furthest lady was Jean Scott. 110 players entered on the day, from Orkney, Shetland, Caithness and further afield. Many thanks to all who turned up, and to our sponsors for their much appreciated support. Ivan Leslie beat Iain Wilkie in the final to win £500 cash and the cup. Iain won £200. Losing semi finalists were Stewart Tait and Brian Moar, £50 each. Iain beat Stewart, Brian lost to Ivan. Losing Quarter finalists were Derek Firth, Brett Dickinson, Robbie Stanger, and Neil 'The Whippet' Croy. Woman's winner was Irene Thomson, KDDL B league winner Brett Dickinson, they both won £100. 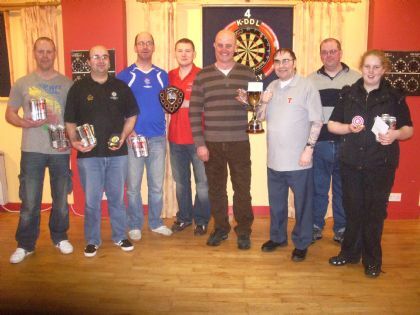 Over £1000 of prize money was given out on the day. Thanks to Carling and JW Gray for their support once again. Kevin Gray beat defending champion Robbie Stanger 5-1 in the final to win his first Carling Kirkwall Open. Kevin had earlier beaten Wick's Tam Mulraine in the semi-final and Robbie beat Michael Bain in the other semi final. Debbie Tait lost out to Tam Mulraine in the quarter-finals and received the prize for the furthest progressing lady on the day whilst Keith Bain received the prize for the furthest 'B' player after beating Ryan Tulloch in a play-off. Both players had made it to the last 16. A record breaking entry of 122 players took part in the competition from Orkney, Shetland and Caithness. Many thanks to all who played and to all the sponsors involved. 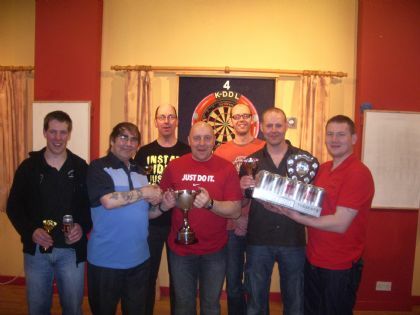 Recreation Club, Kirkwall & District Darts League and Jim Scollie. Robbie Stanger beat Dennis Watt 5-2 in the final of the Tennent's Kirkwall Open, winning the title and the £500. Dennis received £200. Linda Harcus was the furthest lady player, winning £100 and Michael Muir Snr was the furthest B league player and also won £100. 89 Players from Orkney, Shetland and Caithness took part. 94 players contested the 2010 Tennent's Kirkwall Open with players travelling from around Orkney, Shetland and Caithness to take part. 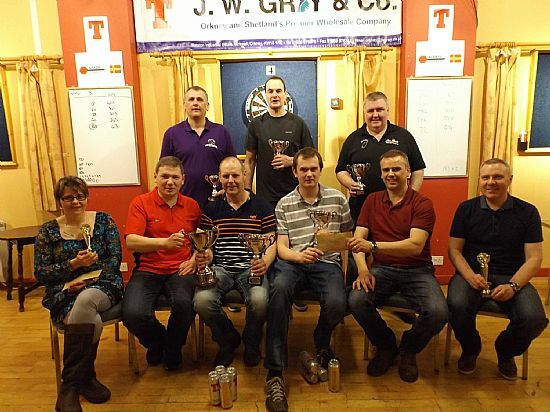 Once again it was two Orkney players in the final, this time Stevie Linklater beat Kevin Gray in a fantastic final. Stevie won the top prize of £500. In total £1080 in prizemoney was given out to the winners. 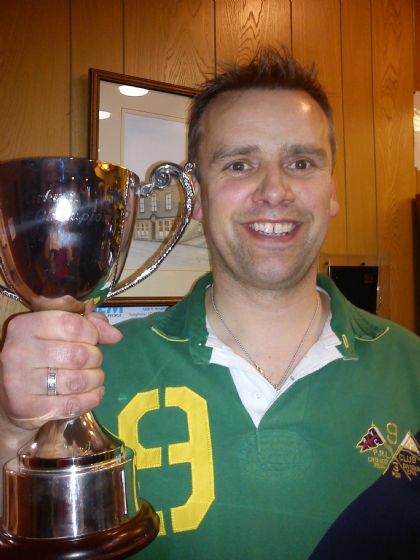 Derek Firth was the 2009 Tennent's Kirkwall Open champion. He beat Ian Linklater 5-2 in the final, winning the cup and £500. Ian won a shield and £200. Semi final players were Kevin Gray and Brian Moar. The £100 prize for the furthest woman was won by Tracey Matheson, and furthest Kirkwall B league player was Derrick Firth who also won £100. 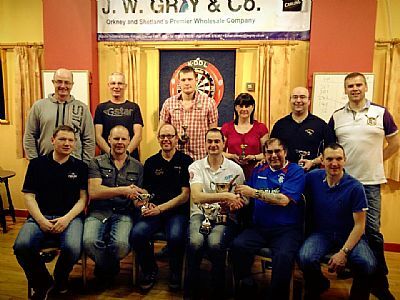 81 players from Orkney, Shetland and Caithness took part in the event held in the Masonic Club on Saturday April 11.